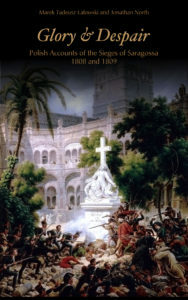 The twin sieges of Saragossa became a symbol of the determination of the Spanish people to resist Napoleon’s invasion. The French would launch two attempts to capture the capital of Aragon and whilst the first, launched in the summer of 1808, would fail, the second triumphed at great cost in early 1809. Both were hard, heroic struggles. And both sides showed equal heroism. The stubborn resolve of the inhabitants, only weakened by disease and starvation by degrees, was pitted against the determination of Napoleon’s soldiers in a war which became increasingly bitter with each step the French made into the ruined city. Napoleon’s troops included a large contingent of Poles. This book presents four detailed eyewitness accounts by three Polish infantry officers and a cavalry officer of the Vistula Legion. It relays their sense of horror at the slaughter and awe at the heroism of the besieged, and reveals their doubts as they, men who had enlisted with the French to liberate their own country, found themselves thrown into a conflict so evidently destroying the liberty of others. The accounts by these careful observers recount what siege warfare was like during the Napoleonic Wars, and what it was like to be ensnared in the worst of those sieges. It makes for a tale of glory in the streets and amongst the squares, and bitter despair amongst the ruins of what was once a great and imposing city.